Very nice captures, can you show us how you connect the A7s to your NV device? 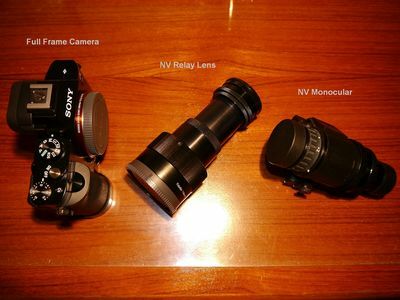 My NV device is an ITT 6010 monocular (no longer in production). This monocular, the Litton M944/M942 monocular, and the ENVIS, all accept an ocular with the same thread specs. The ocular can be removed and replaced with a relay lens for photography. 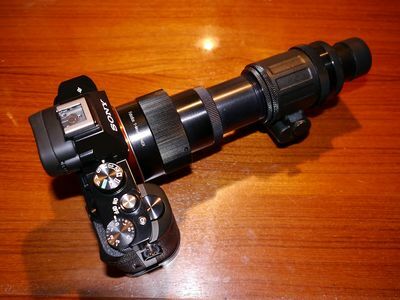 I am using what I best understand to be a prototype version of a B E Meyers full-frame NV relay lens (part # 702-D) intended for the BE Meyers Dark Invader NV monocular (aka Night Owl). I have had a custom adapter made that allows this relay lens to attach to my 6010 monocular. Wow, just beautiful pics, STUNNING!